Thanks to our newly built vertical storage facility, we have been able to streamline our logistics and this investment has also resulted in new working practices and made it possible to handle greater volumes. Our car recycling operation also includes stocking a large number of used tyres and rims of all sizes and dimensions. Contact us to find out more about our current stock. We offer a wide range of bodywork parts that are suitable for the majority of new cars on the market. Allbildelar is a family business that was established back in 1964. We now have 28 employees. We take apart 4,000 cars per year. Around 80 per cent of these are relatively recent models and we predict a steady increase in the future. We have a modern tyre workshop with both new and used tyres. 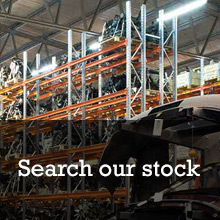 Buy used car parts directly via our website. 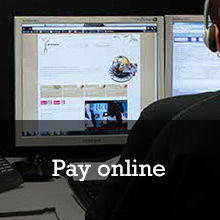 Pay in advance using a credit card. 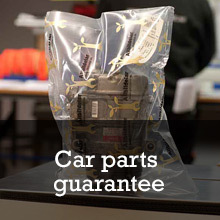 We provide a Direct car parts guarantee on parts marked with a guarantee symbol. 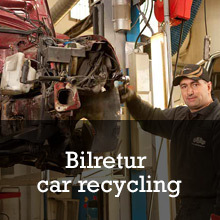 We care about the environment, that is why we work together with Bilretur car recycling.